The People’s Assembly Against Austerity has been called to bring together campaigns against cuts and privatisation with trade unionists in a movement for social justice. This is a call to all those millions of people in Britain who face an impoverished and uncertain year as their wages, jobs, conditions and welfare provision come under renewed attack by the government. The Assembly aims to develop a strategy for resistance to mobilise millions of people against the Con Dem government. Tony Youens, a member of Derbyshire Green Party, attended the Nottingham People’s Assembly on 18th May and the following is his report. The Assembly was a very well attended event, which was probably a measure of the amount of anger and frustration with the Coalition Government and their seemingly relentless attack on the most vulnerable members of our society. The day began with an introductory session and speeches from Alan Simpson (ex Labour MP for Nottingham South), who focused on climate change and renewable energy and Liz Kitching from the Leeds Bedroom Tax campaign who made an outspoken, and I’d say outstanding, attack on this heartless and outrageous policy. For my first session I chose ‘Direct Action’. As it turned out this was a popular choice and space was severely limited. The speakers were activists from Greenpeace and therefore had a lot of experience to share. They outlined tips on how to plan a campaign and to practise we split into groups each of which chose a particular cause. It occurred to me that ‘fracking’ would be a good choice but the clear favourite was the afore mentioned ‘bedroom tax’ and as it turned out it was the choice of all the other groups too. Another indication of how much it is despised. To finish we were shown the best way to construct a human chain so as to create a strong barrier. After lunch I went to another extremely well attended session ‘Alternatives to Austerity’. 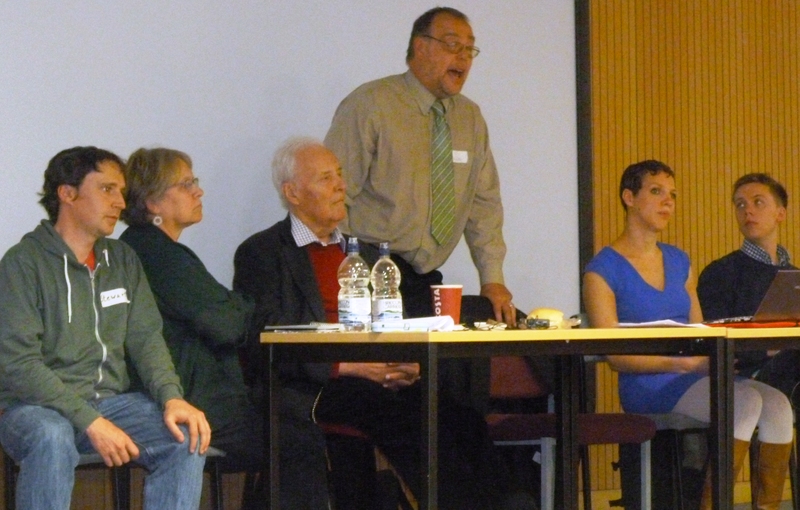 There were two main speakers, Professor Andreas Bieler and Greg Marshall a local Labour Councillor and amongst those shoe-horned into this packed event was our very own Katherina Boettge and Deputy Leader of the Green Party, Will Duckworth. Following both talks people were invited to ask questions and make comments, which led some of us present to make a very interesting observation. Most, if not all, of the suggestions put forward were already Green Party policies. So the clear answer to building a fairer society is to vote Green! The Final Plenary was so popular that we had to move to larger premises and looking at the list of speakers you can see why. And of course Will Duckworth, our Deputy Leader. It was a real privilege to listen to these speakers all of whom received enthusiastic applause. Francesca deservedly got a standing ovation. I think a special word of thanks should go to Stewart Halforty who made this all happen. On a personal note I came away feeling very proud of the fact that I am in The Green Party that puts social justice for all at the heart of its policies. The local Assemblies will provide a national forum for anti-austerity views building up to The People’s Assembly Against Austerity at Central Hall, Westminster, on 22 June (register at www.coalitionofresistance.org.uk). There is also an event planned by the Derby People’s Assembly on 3rd June to prepare for the Westminster assembly. It will be at the Derby City Council House in Corporation Street at 7:30pm. This entry was posted in Community, Derbyshire County, East Midlands, Economy, Events, National, Political Reform, Public Services and tagged austerity, cuts, Economy, Green Party, People's Assembly, public services. Bookmark the permalink.